Clients can carry bottles to parties and events with this advertising item! 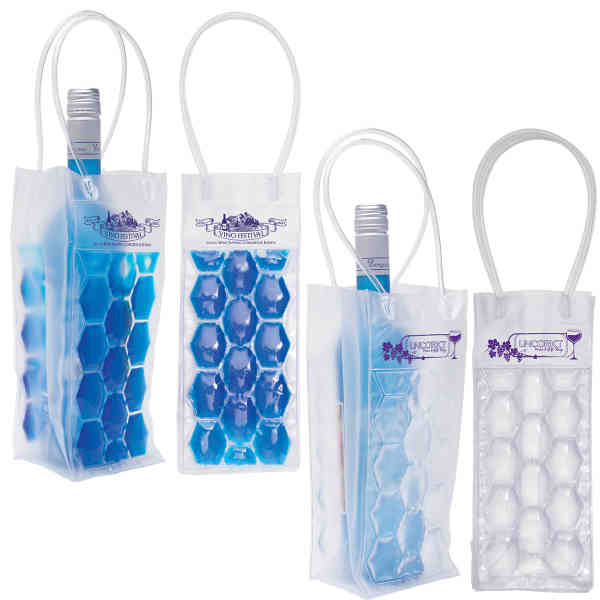 The Wine Cooling Tote measures 10 1/4" tall, comes in blue or clear coloring and can be frozen and reused repeatedly. The tote has 5" heat-sealed tube handles for transporting drinks while representing your business with a pad-printed logo, image or advertisement placed inside a 3 1/4" x 1 1/8" imprinted area. Ice can be added for extending the freshness of the bag, which is great for beverage centers, wineries, vineyards and liquor stores to promote their brand. Simply rinse with soap and water, allow to air dry and get extra life out of this promotional plan! Size: 4 " x 10 1/4 " x 1/4 " 4 " x 10 1/4 " x 3 1/2 "
Imprint Size:3 1/4" x 1 1/8"
Price Includes: Sold at 1/2 minimum order quantity at end quantity price. Price Includes: per color for all other PMS colors not listed. PMS exact color match is not guaranteed.